Being a member of Tri-State Poodle Club grants you access to all events, includes you in our member discounts to a wide variety of workshops, events and club items as well as to a growing list of local businesses, permits participation in club elections, allows you to share in the reputation of being a Tri-State Poodle Club member and signer of our Code of Ethics, and support our mission to promote and protect poodles in the Illinois/Wisconsin/Iowa tri-state area through community, education, performance, and rescue. You do not need to own a poodle to be a member. Current memberships expire September 31st, 2014, applications are approved unless you are contacted otherwise. Once your application is submitted, you may pick up your membership card at any Club event. 1) Complete and submit the form below which includes general information and Code of Ethics agreement. If there are members of your household under the age of 18 that would like to be a member and/or participate in club functions, they are most welcome but we do need a bit more paperwork. If it applies to you, please complete the additional section further down the page for each interested, "Junior Member" of your household. 2) Pay annual dues ($35 per household per year) by using the link/button below to pay with PayPal OR by mailing a check to Tri-State Poodle Club, Inc. at 1008 Shady Lane, Dubuque IA 52001, OR directly to a board member at any event. 3) (Optional but appreciated!) Fill out and submit the photo release form at the bottom of the page. 1) (Optional) Update personal information by completing and submitting the form below. 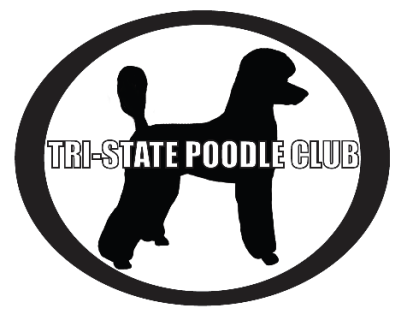 Thanks for supporting the Tri-State Poodle Club mission! · Support the Club mission to promote and protect poodles by participating in at least one of the Club’s four focuses: community, education, performance, and/or rescue. · Maintain the best possible standard of care for my dogs with regard to nutrition, housing, safety, grooming, exercise, cleanliness and veterinary care. · Seek to understand and fulfill the specific needs of my poodle(s) including its high need for socialization and great deal of human contact. · Consider re-homing my poodle if at any time I should no longer have time or resource to fulfill all its needs. · Seek the advice and insight of more experienced breeders and owners and graciously provide what assistance I can to those wishing the same from me. · Display good conduct and sportsmanship at all times, respecting both the wins and the losses of others in competition, whether at home, traveling, or at shows. · Refrain from serious obedience, agility or other physically demanding training until a puppy is of a suitable age where it has both the strength of body and mental capacity to endure such demands. · Ensure tagged collars are worn when my dogs are away from home and it is safe and permitted to do so. · Responsibly clean up after my dogs in public places. · Contact the club should I need help re-homing a dog. · Sign the TSPC breeder code of ethics before breeding my dogs. · Conduct any business dealings concerning my or others’ dogs in an ethical manner. · Abide by the by-laws set by the Club. · Act in the best interests of the breed, the Club, and the membership as a whole, in all questions of ethics covered or not covered by this Code. · Bear in mind that a Code of Ethics is more than a set of rules, understanding that it is a commitment to a high standard of practice in owning and breeding and that adherence to the spirit of the Code is as important as adherence to its law. I understand that any breach of the Code of Ethics brought to the Board's attention will be responded to with the primary intent of correction, education, and restoration but, when appropriate, may include expulsion from Club membership and/or reporting to the relevant authorities. By typing my name in the box below, I hereby make application for membership to Tri-State Poodle Club and agree to abide by the Club’s Code of Ethics and by-laws and participate in at least one event or support activity per year. Further, in typing my name in the box below, I hereby, for myself, my heirs, my executors and administrators, waive and release any and all rights and claims for damages that I may have against Tri-State Poodle Club, Inc. and Tri-State Poodle Club Outreach, Inc. and its agents, members, representatives, successors and assigns for any and all injuries suffered by myself, my household, or my dogs that arise out of Tri-State Poodle Club, Inc. and Tri-State Poodle Club Outreach, Inc. activities. To be completed by Junior Applicant. To be completed by Junior Applicant's legal guardian. I give permission to the above listed junior member to participate in any Tri-State Poodle Club events in which I or another (non junior) household member also participates, understanding that this will involve the junior member’s contact with dogs whose behavior cannot be guaranteed. I understand that for the safety of everyone involved, the junior member’s permission to participate is perpetually provisional to their compliance with directions given them at Club events. I understand that supervision of the above listed junior member at Club events is solely the responsibility of my household’s members also in attendance at any given event. In typing my name below, I hereby, for myself, my heirs, my executors and administrators, waive and release any and all rights and claims for damages that I may have against Tri-State Poodle Club and its agents, members, representatives, successors and assigns for any and all injuries suffered by the child of whom I am the legal guardian that arise out of Tri-State Poodle Club activities. To be completed by legal guardian. I hereby grant Tri-State Poodle Club permission to use my likeness and the likeness of my dogs as well as any identifying information in all photographs taken at any event hosted by or publicized through any venue of Tri-State Poodle Club or submitted to the club in any way, including but not limited to Facebook, email, and SD card in any and all of its publications, including but not limited to website and Facebook entries, without payment or any other consideration. I understand that I will not be notified at any time of the use of these materials. If at any time, however, I should become aware of their use electronically (ex. on the website or Facebook) and should wish to request that such use be discontinued in future electronic use, I may make that request to Tri-State Poodle Club with expectation that due consideration will be made to grant my request. I understand that the same considerations cannot be made for materials used in printed forms. I hereby irrevocably authorize Tri-State Poodle Club to edit, alter, copy, exhibit, publish or distribute these photos for purposes of publicizing Tri-State Poodle Club’s programs or for any other lawful purpose. In addition, I waive the right to inspect or approve the finished product, including written or electronic copy, wherein my likeness appears. Additionally, I waive any right to royalties or other compensation arising or related to the use of the photograph. I understand and agree that these materials will become the property of Tri-State Poodle Club and will not be returned. I hereby hold harmless and release and forever discharge Tri-State Poodle Club from all claims, demands, and causes of action which I, my heirs, representatives, executors, administrators, or any other persons acting on my behalf or on behalf of my estate have or may have by reason of this authorization. Please type your name in the boxes below for electronic signing of this form.